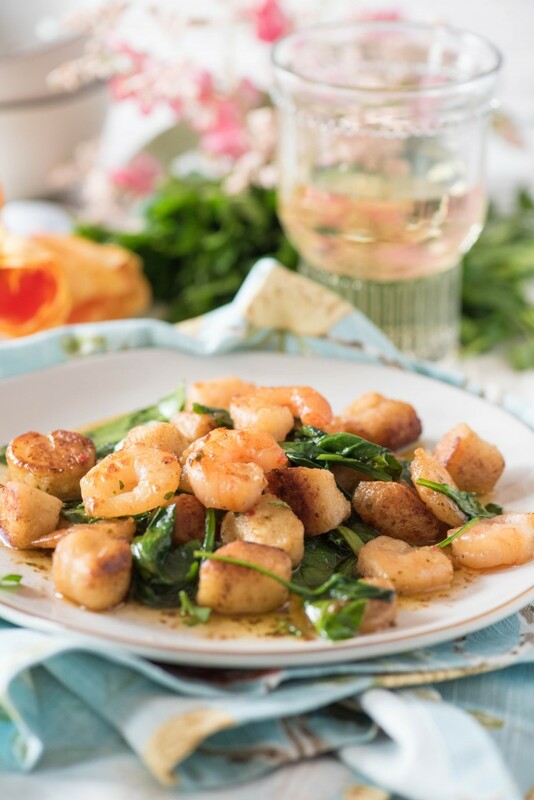 This delicious shrimp scampi is tossed with a light and crispy ricotta gnocchi (also called gnudi) made from scratch. You’ll never believe how easy it is to make homemade light and fluffy gnocchi! I love making gnocchi with ricotta cheese instead of potato. For whatever reason, I could never get the texture of homemade potato gnocchi just right- but ricotta gnocchi, also referred to as gnudi) is infinitely easier and fail proof. I’ve been hooked on ricotta gnocchi since the first time I tasted them. Since these are cooked in a skillet with butter and/or oil, not boiled, they have a completely different texture. They are, in my opinion, an absolute delight- light and fluffy insides with crispy, buttery, golden outsides. A super simple dough is mixed together and left to relax in the fridge, then rolled out into ropes and cut into small pieces. A quick sauce in butter and oil cooks the gnocchi, yielding a crispy crust outside and a pillowy soft inside. Don’t over work your dough- this is what makes any dough tough. Mix as little as you can- just until everything comes together. Use a nonstick skillet for sautéeing the gnocchi. This pasta is a great blank canvas for a variety of dishes, but I paired it with SeaPak® Shrimp Scampi. I’ve always been a big fan of their shrimp offerings (search for the Coconut Shrimp Po Boy that I created last year), and their Scampi is top notch. 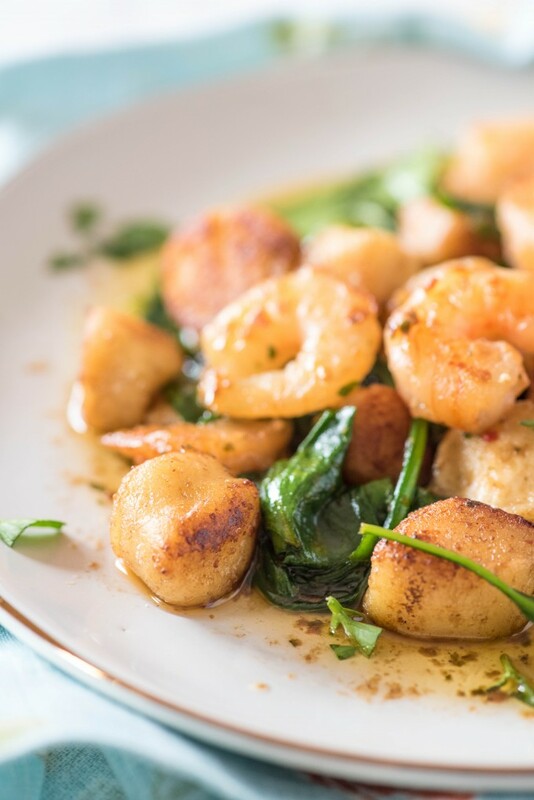 I cook SeaPak’s Shrimp Scampi according to package directions, then remove to another bowl, leaving a few tablespoons of the buttery garlic sauce to sauté the gnocchi, then add them to the bowl as well and toss them all together. I also added some baby spinach when cooking the shrimp, just for an added color (okay, AND the addition of a vegetable). The dinner was light, easy, and a hit with the whole family! Dave and I enjoyed pairing it with a chilled glass of Clos du Bois Chardonnay, one of our favorite white wines. It’s a very light and crisp chardonnay, with bright flavors of apple, pear and citrus, paired with a buttery oakiness. We love it with light dinners, like salads, seafood, pasta, or poultry. It’s a great drinking wine, and I often use it when cooking as well! For a limited time, you can visit www.SipBackRelax.com for special reward offers and recipes. In a medium mixing bowl, add the ricotta, eggs, lemon zest and salt. Stir together using a fork. Sprinkle 1/2 cup flour over top and mix together until just combined.. Dough should be sticky but able to be handled. Sprinkle 1/4 cup flour onto a countertop or cutting board. Turn out the dough and gently knead until the dough is soft, but not overly sticky, and the rest of the flour has been incorporated. Wrap in plastic wrap and refrigerate for 30 minutes. Sprinkle countertop lightly with flour. Divide dough into four pieces. Heat a nonstick skillet over medium high. Cook Shrimp Scampi according to package directions. When almost finished cooking, wilt in baby spinach. Remove to a bowl, reserving approximately 3 tablespoons of butter sauce in the pan. 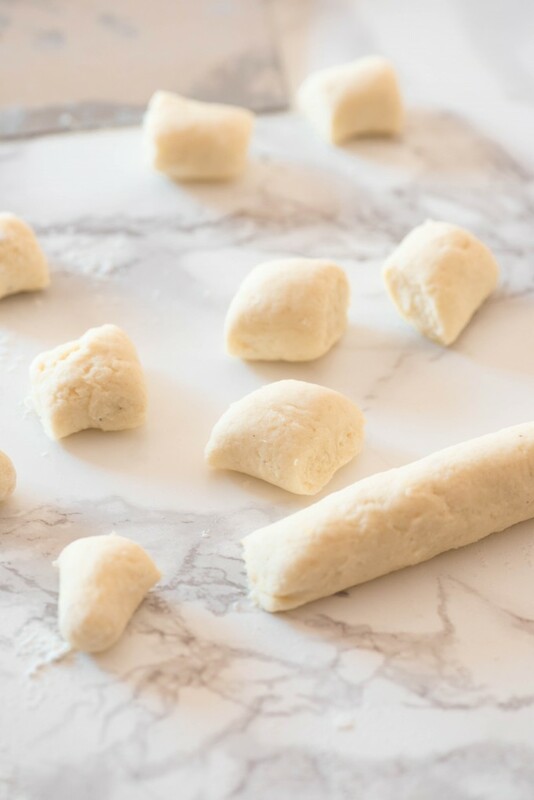 Working in batches, roll one piece of gnocchi dough into a long rope, then use a sharp knife to cut into approximately 3/4" pieces. Add to skillet and brown on all sides. When golden and crispy, add to bowl with reserved scampi. Repeat with remaining three portions of dough. 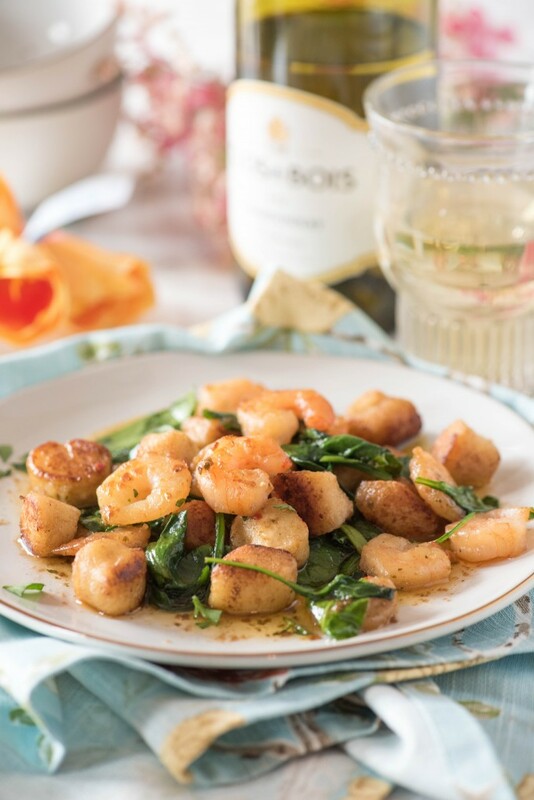 Toss gnocchi together with spinach and scampi. Serve hot. 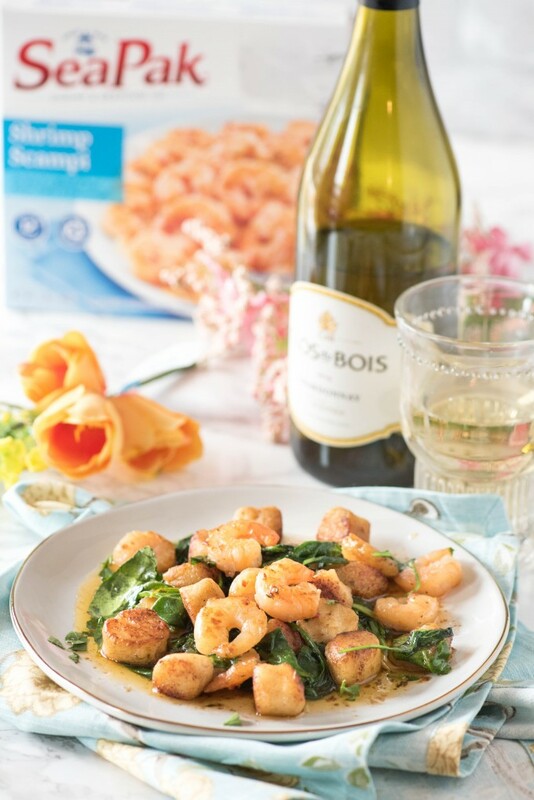 Pair with a glass of Clos du Bois Chardonnay for the perfect, relaxing, and delicious evening.